Please join us for an interactive theatrical experience designed for young people on the autism spectrum. Open to youth of all abilities. Presented in partnership with the Flynn Center. Ages 4 & up. 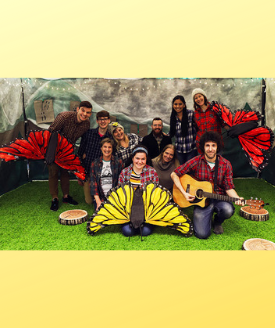 Red Kite Green Mountain, designed for young people on the autism spectrum and their caregivers, is about making connections, fostering a strong sense of community, belonging, and comfort in just being who you are in a safe, gentle, welcoming environment. Developed by the Flynn in collaboration with Chicago Children's Theatre in 2018, the performance features local artists and educators and beautiful, interactive puppets. These multi-sensory adventures are kept small and intimate so that the experience serenely moves participants through the seasons and wildlife of Vermont with playful activities bringing young people into the world of the Green Mountains mindfully, always offering choice and support along the way. The show is approximately 45 minutes and is followed by an optional meet and greet with the local actors and their puppets.